These rules were voted on and ADOPTED after 4 months of discussion, in November 2009. Please fly safe and respect these guidelines. Protected PIT Areas: UNDER NO CIRCUMSTANCES should either helicopters or airplanes intentionally fly over any pit area, the shelter or the parking area. This is true if the pit areas are OCCUPIED OR NOT. Fixed Wing Aircraft: All fixed wing powered aircraft must fly north of a line going east to west from the safety fence in front of the pit area and parallel to the runway. Only during a landing approach may a pilot fly closer to the Helicopter area, but only up to a line connecting the Airplane pit area to the Radio Tower at the east end of the field. This requires that all landing approaches going from the east to the west be made with a right hand turn. Helicopters generally fly North of the two Helicopter tables by the woods, while staying South of the physical paved runway. Helicopter flyers must also limit flying toward the parking lot and aircraft pit areas. 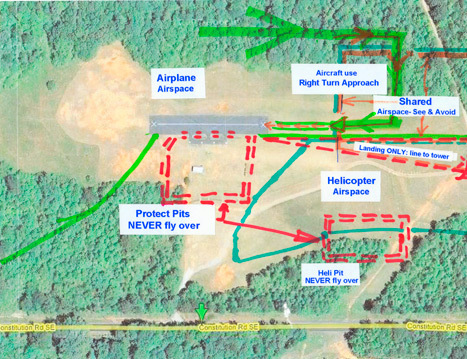 While flying to the west (toward Downtown Atlanta) the helicopter flight zone ends along a line that extends from the east end of the runway to the old helicopter safety net and then to the park lot. The “old helicopter area” near the runway shall only be used for hover practice and all helicopter pilots should avoid flying over the runway. Shared Zone: There is a zone where both airplanes and helicopters are both permitted. This zone begins approximately 150 feet EAST of the end of the runway, and extends to the East to the tree line. When both airplanes and helicopters are flying, it is recommended that ALL pilots flying in the intersection zone use “spotters” to give them advanced warning. Everyone must practice the rule “see and avoid”. Helicopters will attempt to minimize the time they spend in the intersections zone when airplanes are using it (especially when wind is out of the West, and airplanes are landing). Safely comes first. Every flyer and club member shall share responsibility for safety at the flying field. If you see something unsafe, correct it immediately if you can. Bring unsafe conditions or actions to the attention of the individual and Safety Officer. All pilots must have a current AMA membership on their person in order to fly. All pilots must abide by the current safety rules and regulations of the AMA and the ARCC pertaining to the use and operation of radio controlled model aircraft. All pilots must obey the flight lines as depicted and posted on the frequency board and in the helicopter pit. All airplane pilots will stand in one of the four designated pilot boxes when flying aircraft. Helicopters may practice hovering in the grass area at the southeastern corner of the field. All turns after takeoff are to be away from the pit or spectator areas, and no flying is to be done over the pit, spectator, or parking areas. The frequency board will be used at all times by all 72 MHz pilots. Each pilot will use the corresponding frequency pin for the channel and attach it to their radio. All radios shall be narrow band. Transmitters must have frequency numbers attached. All transmitters must have gold stickers, except for 53 MHz operation. All airplane engines must have the crankshaft end covered by a spinner or an acorn type prop nut. All threads must be covered. All engines .15 cu and above must be equipped with a muffler or pipe device to reduce noise. Certain racing aircraft are exempt from this rule as specified in the AMA rules. Flyers using gasoline engines must have an operational fire extinguisher on hand in accordance with AMA regulations. All spectators must remain behind the roped safety line unless escorted by a club member. Engines are not to be started or restarted on the runway. Starting of engines may take place in the pits or on the taxiway. No aircraft will be taxied back to the pit area. Shutdown of engine(s) is to occur at the taxiway entry. Takeoffs and landings shall be executed with prevailing traffic pattern. Changes in the direction should occur only when all aircraft have landed and all pilots have been informed. All aircraft shall contain the owner’s name, address, phone number and AMA number. No alcoholic drinks are allowed on the property. No flying while under the influence of alcohol or drugs. All aircraft and field boxes should remain in the pit area behind the frequency board line when not in use. Any member sponsoring a guest should be with that guest when they are at the field. There shall be a maximum of four (4) transmitters on at any time for flight. Two additional transmitters can be used for ground testing only. Landing aircraft have unconditional right of way. Landed aircraft shall clear the runway as soon as possible. Notify all pilots before walking onto or crossing the runway. No R/C cars are allowed at the field. The field is closed to public flying when any club organized or club sponsored event is in progress, including awards, special recognition, or meetings. Do not stand in the line of the prop arc of a running engine. Children and pets are not allowed in the pits and must be supervised by a non-flying, non-participating adult. Please limit flights to fifteen minutes. If the engine doesn’t start in five minutes, give up the frequency and check out the problem. Don’t pin up on the frequency board until the aircraft is fueled and ready to fly. Use ground-testing clothespins for testing. In the event of a crash, maintain your frequency pin, locate the aircraft as soon as possible, THEN turn your radio off. At that point, return the pin to the board. If the aircraft is unrecoverable, turn your radio off and return the pin to the frequency board. Announce takeoffs, landings and dead sticks so others may clear the way. Range check radios when new, repaired, or after a crash. Keep the flying field area clean. Feel free to pick up after other members not quite as neat and clean. Ask unfamiliar flyers if you can help, and if they have a membership card. Remember that everyone is flying for FUN. ATLANTA RADIO CONTROL CLUB, INC. The name of this club shall be the ATLANTA RADIO CONTROL CLUB. INC. This club is a non-profit corporation incorporated under the laws of the State of Georgia. The objectives of this club shall be to promote the building and flying of remote controlled model aircraft in this city's general locality, and to aid insofar as possible the national program of the Academy of Model Aeronautics and looking forward to the continual advancement of model aviation in all its phases in the United States. Section 2. All special or local enterprises of this club shall conform to the policies of the AMA and to the regulations of that organization governing model aircraft contests. All persons shall be eligible for membership in this club, provided they meet the qualifications prescribed by this club. The Officers of the Atlanta, R/C Club, Inc. shall be elected by a majority vote of the members present and voting. The Officers shall be elected from the Active Membership and shall consist of a President, a Vice President, a Secretary, a Treasurer and a Safety Officer. In the event of death, resignation, removal by quorum, or disability of an officer, the vacancy for the remainder of the term shall be filled by a vote of the assembled quorum. If there are no candidates for the vacancy, the Officers may ask for a volunteer until the next election is held. If there are no volunteers, the Officers must take care of the duties in question, until a replacement can be found. The term of the Office shall be one year. Multiple terms are acceptable. All Officers hold equal power. All decisions must be reached by a majority vote. The Secretary and Treasurer may be combined upon a majority vote of the club membership. The position is optional. Each Officer will be furnished with the job description of his office. The President shall preside at all meetings of the club and shall act as spokesman for the club in all matters pertaining to it. The President shall have authority to transact all official business for and on behalf of the Corporation. The President shall have the power to veto any matter before the club for a period not to exceed 30 days. The Vice President shall assist and act for the President when the President is unable to serve. The Vice President shall also be chairman of the program committee. The Secretary shall have the responsibility for all records, rosters, charter renewal and correspondence; keep the minutes of the meetings and attendance of such meetings. An official minutes book shall be maintained. The Treasurer shall receive all funds due the club. The Treasurer shall maintain records sufficient to permit financial control and auditing. The Treasurer will give a monthly financial report to the general membership at the club meetings. The Treasurer shall provide to the Secretary the names of all Active Members. The Safety Officer shall have oversight of safety issues pertaining to the club. Two officers shall be elected – one to cover airplanes and the runway area and one for the helicopter zone. The Safety Officer shall be in charge of managing or delegating safety coverage for events held at the club. The Editor shall be an appointed volunteer. The editor is responsible for developing, publishing and distributing a monthly club newsletter. The Board of Directors shall consist of the elected officers for their term of office and two (2) members elected from the club membership at large. The Board of Directors may hold meetings in any location. A majority of board members shall be necessary for the transaction of business, except as may be otherwise specifically provided by the by-laws. The Board of Directors shall act on all matters of general policy. A candidate for office may put forth his/her own name or be nominated by an active member. Qualifications of an officer shall include paid, active membership in the club and in the Academy of Model Aeronautics and a willingness and ability to serve in the open position. At the end of two consecutive terms in the same elected office, a person may be nominated only for a different office. An absence of one year would allow a person to again be nominated to any office. If no nominees are presented for vote, the current officer may assume the office for an additional year. The slate shall consist of at least one candidate for each office, and no nominations shall be considered valid or placed on the ballot without the nominee’s consent. Nominations from the floor will be accepted at the annual meeting. Elections shall be held at the annual meeting in November. The newly elected officers and directors shall be duly installed and will assume office on the first day of January of the following year. All Officers of the Atlanta R/C Club, Inc. shall serve one (1) year from the date of installation (January 1st of each year). Members at large of the Board of Directors shall consist of two (2) members who shall be elected to office in the manner specified for club officers. The Board of Directors shall be the governing authority on clarification of the meaning of vague articles or amendments. All member of Atlanta RC Club are subject to the terms of membership, including all membership levels, officers and members of the board of directors. Any person 19 years of age or older as of July 1st shall be considered for Active Membership. Applicants for Active Membership must also apply concurrently for membership in the Academy of Model Aeronautics. Individuals 19 years of age or older may hold office, a position on a standing committee and vote on the business affairs of the Atlanta, R/C Club, Inc. It shall be the duty of the Active Member to uphold the Constitution and Bylaws of the Atlanta, R/C Club, Inc.
Members of the immediate family, (of an Active Member) 19 years of age or older, as of July 1st may be considered for Family Membership. Family shall be defined as immediate family member residing with or at school or College and meets all IRS test pertaining to dependent of the head of the household. Applicants for Family Membership must also apply concurrently for membership in the Academy of Model Aeronautics. It shall be the duty of the Family Members to uphold the Constitution and Bylaws of the Atlanta, R/C Club, Inc.
Any person who is a full-time student or 19 years of age or under as of July 1st shall be considered for Junior Membership. Applicants for Junior Membership must also apply concurrently for membership in the Academy of Model Aeronautics. It shall be the duty of the Junior Member to uphold the Constitution and Bylaws of the Atlanta, R/C Club, Inc. A person holding a Junior Membership shall not have voting privileges or hold office. Upon reaching the age of 19 the Junior member will become a Single Member and be responsible for the yearly Single Member dues. Upon unanimous consent by the Board of Directors, a free lifetime membership may be conferred on deserving club members. If the conduct of a member shall appear to the Board of Directors to be disorderly or to be prejudicial to the welfare or good name of the Club, or if in any way any member conducts him/herself in a manner not authorized by or in violation of the By-laws of the Club or the safety rules and guidelines set forth in Article VI below, he or she may be subject to censure, suspension, or expulsion at the discretion of the Board of Directors, depending upon whether such infraction is deemed to be slight or serious. Any misconduct or infraction censured as a first offense, subjects him/her to suspension or expulsion upon the repetition of such misconduct or infraction. In case such offending member is suspended from membership in the Club, he/she shall be deprived of all rights and privileges of membership for a period up to three months as may be determined by the Board of Directors in the particular case and at the expiration of the prescribed period, such member shall be restored to his/her previous status with all rights and privileges of membership. In case such offending member is expelled from membership in the Club, he/she shall forthwith forfeit all rights, title, and interest in or to the Club or its property. A member censured, suspended, or expelled per the above, shall have the right to appeal said action to the members present at the next regular meeting. A two thirds vote of the members present shall sustain or revoke said appeal and such a decision shall not be subject to further appeal. A member shall be placed on non-flying status at field if dues are not paid by January 1st of each year. No member shall fly at field without current AMA membership. Flyers are also responsible read the AMA Safety Rules and Field Guidelines and will abide by these rules and guidelines. Vacancy in any office shall be filled by appointment by the Board of Directors to serve until the end of the vacated office, except for Vice President, who will replace the President. Regular club meetings shall be held monthly on the first Sunday of every month at the time set by the club membership. Should the first Sunday fall on a holiday weekend, the meeting shall take place the second Sunday of the month. Special meetings may be called by the President, Board of Directors or by any ten (10) members of the club. Any such call shall name the time, date and place and the membership so notified at least five (5) days in advance of such meetings. The Secretary shall post notification of annual elections on the bulletin board and via email at one week in advance of such elections. Ten (10) voting members must be present in person to constitute a quorum at all meetings of members for the election of officers and directors or for the transaction for other business except as otherwise provided by law, by the certificate of incorporation or by these By-laws. Section 4. The focus of the monthly club meeting shall be the business of the club and should last only as long as needed. Learning and sharing information about the modeling hobby should follow. Section 1. Annual dues amount shall be determined by the financial requirements of the Club for the coming year. Dues shall be prorated after June 1st for new members (not applicable to renewing members). Changes in dues amount shall be presented to the membership for approval. Members may be dropped if current dues are not paid within a reasonable time period after January 1st of each year. Section 2. No special assessments shall be levied upon the club members except at a meeting called for that purpose or at a regular meeting provided members have been notified at least one week in advance. A unanimous vote will be required to levy any assessment on the club membership. Section 3. All elected officers will be given a year’s free dues following the year of their term of office. The Treasurer of this club is authorized to receive contributions or specially obtained funds from individuals or institutions to be applied to the operating expenses of the club. Income realized by virtue of approved organized activities of The Atlanta, R/C Club, Inc. shall revert to the treasury. The standing committees of the club shall be appointed by the President to serve throughout the President's tenure of office and their duties shall be indicated by the names of the committees. Amendments may be made to this Constitution and Bylaws at any general meeting of the club membership by a 2/3 vote of the members present and voting. Special amendments to comply with AMA changes in liability insurance requirements shall be at the discretion of the Board of Directors. No expenditure exceeding $100.00 can be made by any Officer of Member or Committee of the Club without approval by majority vote of the Board of Directors and, or majority vote of active members present and voting. Due to limitations of insurance liability coverage by the AMA Liability Insurance Policy - No Radio Control Models other than aircraft shall be operated or activated on this AMA Club Field. A copy of the Constitution and bylaws shall be made available to all members. Failure to receive or read these articles of the Constitution and Bylaws does not release member from compliance with this Constitution and Bylaws. Request for amendments and or changes to the bylaws and Constitution of this Chartered Club (#223) shall be made in writing to the President. The President shall present the request before the club membership at the next regular scheduled meeting. The Fiscal year shall be from January First (1) to December Thirty-first (31). Section 1. Upon resolution of the members of the Club to dissolve the Atlanta R/C Club, Inc., all assets of the Club shall be returned to their just cash value, which will be used to remove all outstanding debts of the corporation. All funds remaining after all debts are satisfied will then be donated to the Academy of Model Aeronautics. Section 2. A resolution to dissolve the Club must be approved by a two-thirds majority of the voting members at a regular, special or annual meeting. All copies of the Constitution and Bylaws, relating to the Atlanta Radio Control Club, Inc., prior to May 1, 2012, are null and void.